Connecting Niigata and Echigo-Yuzuwa, the Genbi Shinkansen offers passengers a brand new way to interact with modern art. This high-speed train is decked with contemporary art inside and out, earning it the nickname of the world’s fastest art gallery. Each car is curated with a unique approach to art. Hop aboard the Genbi Shinkansen and discover a world of high-speed art! Many of the artworks on the Genbi Shinkansen are one-of-a-kind, commissioned especially for the Genbi. Genbi, by the way, is an abbreviation of gendai bijutsu (現代美術) or contemporary art, an appropriate name for this moving gallery. The first artist’s work you’ll encounter is Mika Ninagawa’s. Ninagawa is a renowned photographer, famous for her colorful, lively photography, as well as her directing work in the entertainment industry. Ninagawa’s eye-catching fireworks photography was chosen for the Genbi’s outer wrap. For car number 11 (the first car), the Genbi mother company JR East invited Japanese contemporary artist and sculptor Nao Matsumoto to take over the design. Matsumoto created brightly colored seat and window covers. These yellow patterns are intended to depict the golden foliage of fall and the harvest. A geometric pattern was selected for the center aisle, also in shades of yellow. 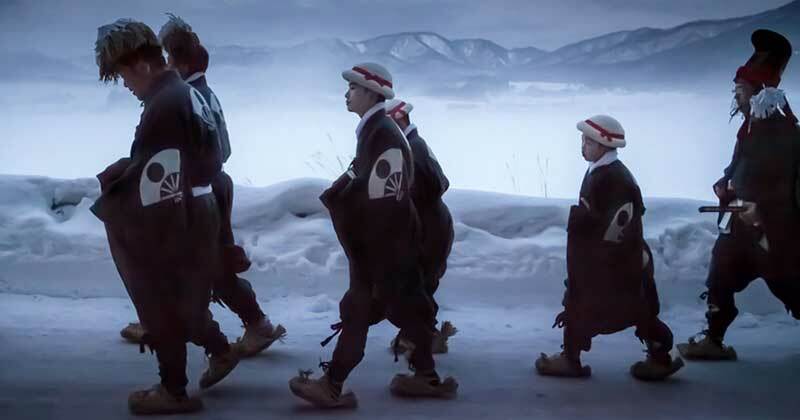 While Matsumoto specializes in sculpture and woodwork, his take on the harvest time and its lively festivals is a good fit for the Genbi Shinkansen. This car is reserved seating only. Next up is the mirrored car. Here, mirrors in alternating fogged and smooth surfaces line one wall, while windows line the other. It’s thought that the landscape passing by outside the window creates the art as the mirrored images unfold like a painted scroll. The artist for this car is Yusuke Komuta. Next up is the Genbi café and kids’ play area. It feels just like a typical dining space in a contemporary art museum, except that this one moves along at 320 km an hour. Kentaro Kobuke’s surrealist art – caricature portraits and avant-garde landscapes – are lined up neatly along the wall of the café. The next carriage is more like a conventional gallery. Photographs and paintings by Naoki Ishikawa are arranged along one side. Naoki Ishikawa is known for his nature and mountain photography, but a wide range of subjects and styles are represented here. This is followed by a kaleidoscope of a mural in the next train. The hanging mural moves freely with the movements of the train behind protective glass. This mural is by Haruka Kojin, a Japanese contemporary artist and architect. Car no. 16 uses screens as a medium for the art. Several flat screens are arranged symmetrically along the windowless wall, streaming video art by New York artist Brian Alfred, the only non-Japanese artists among those selected. 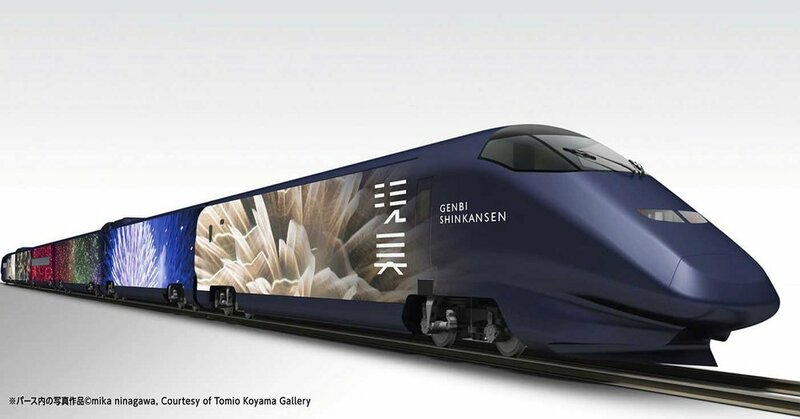 The Genbi Shinkansen is an innovative approach to contemporary art, which allows passengers to simultaneously connect and interact with technology, nature and the artists' designs in a totally unique way. To find out more about the train, including timetables and information about the artists, visit the official site here. To book tickets on the Genbi, visit the JR East reservation site here. Have you been on the Genbi Shinkansen? How did you enjoy viewing art at high speed? Let us know in the comments below!